Time to Talk About Anger? Friends, family, and co-workers can be good listeners, but often they aren’t very interested, don’t understand, just try to “fix the problem”, or perhaps they are somehow involved and become very reactive. And even if you know someone willing to listen, going to the same person continually with the same issue can cause distance or even avoidance of the relationship. 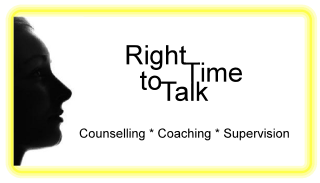 A counsellor is a skilled professional trained to actively listen without judgment, understand your perspective, empathize with your feelings, and together over time, gain a deeper understanding of you and your life. 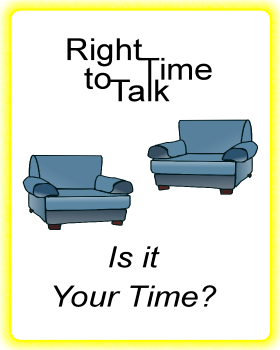 At Right Time to Talk I believe that both speaking what’s on your mind and expressing the associated feelings are essential in energetically freeing you from the past, recent or distant, and empowering you to make new decisions that influence the course of your life. Whether you are wrestling with unwanted/unpleasant thoughts, painful/disturbing feelings, or dysfunctional life patterns, we will work together both cognitively, emotionally, and even physically to find ways in which you can passionately stand forward on your own behalf to create the life you want.